Remember: If you approach each day as Valentine’s Day, you’ll never find yourself corralled into a restaurant waiting area like over-dressed cattle, elbow-to-elbow with a bunch of strangers during flu season. Preheat oven to 350. Line muffin tin with baking liners or grease and flour the muffing cups. Cream butter and sugar on medium-high for two minutes. Mix in one egg at a time, beating after each addition. Turn mixer off and add food coloring and cocoa powder to bowl. Turn on low until just incorporated and then beat on medium for 4 minutes. Sift together the flours, salt, and baking soda and set aside. Stir buttermilk and vanilla together. Add dry ingredients to the bowl in three batches, alternately with the buttermilk in two batches, starting and ending with the dry ingredients. Beat on medium until just combined. Add sour cream and vinegar and beat on low until combined. Fill muffin cups 3/4 full (I used a number 12 scoop to fill the liners) and bake for 25-35 minutes until the cupcakes test done with a toothpick. Let cool in the pan for 5 minutes and then cool completely on a rack. Cream cream cheese, butter, and vanilla on med-high speed. Sift the powdered sugar after measuring. Add the powdered sugar to the bowl in batches, beating on low until just combined and then beating on high until desired consistency is reached. For a stiffer icing, add more powdered sugar. I love this photo – it makes the cupcake look so ….regal or something. Love the frosting! I love red velvet cupcakes. They may be my favorite kind of cupcakes. These look amazing. Red Velvet cupcakes are my absolute favorite. Yum! This photo is perfection. The frosting looks like big snow peaks 🙂 I agree with you, everyday should be valentines day! That saying could be the best thing I have ever read. We don’t do the Valentine’s Day thing either. We don’t celebrate just on Valentine’s day at our house. I think every day with my hubby is a reason to celebrate our love! I totally agree with your Valentine’s Day view. Stunning little cupcake. Looks like it packs a lot of love. These look amazing, I want to make some of these! This is awesome, I love red velvet! I’m making these this weekend, I hope they taste as good as yours look! Lovely! 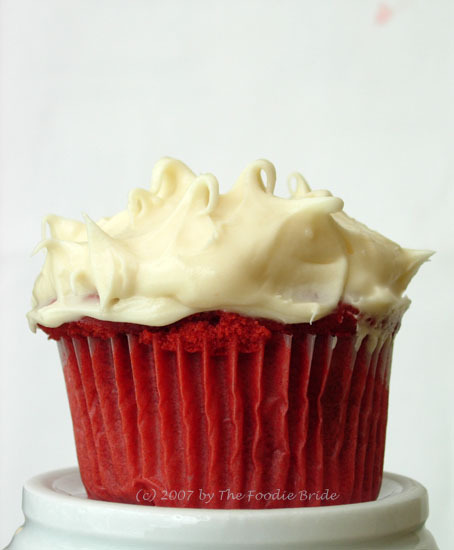 I love red velvet–so perfectly southern and decadent!